Here in Mid-Wales the landscape is looking lovely as the leaves spring forth and everything looks so fresh. I’ve been out a lot on the hills walking and sketching in sunshine and showers: the perfect weather for the landscape artist. With clouds scudding past at quite a rate it’s creating a marvellous series of rain-squalls followed by intense light, and if you are happy to put up with the odd dousing you can learn so much from these dramatic atmospheric effects. With the ever-changing light you can study how the shadows lose parts of the landscape, whilst throwing the emphasis onto those sunlit areas. Shadows cast partly across a mountain face as in the watercolour above can be really appealing, and often a great improvement on painting the whole face the same tone. The device of a darker foreground is an excellent method for suggesting a sense of depth and space in a composition. The original of this watercolour can currently be seen in the Ardent Gallery at 46 High Street, Brecon. I have recently started exhibiting there and it’s a lovely gallery to visit. They make a delicious cappuccino, as well! Their telephone number is (44) 01874 610710 Make the most of spring-time – it’s a great time for artists to be out. 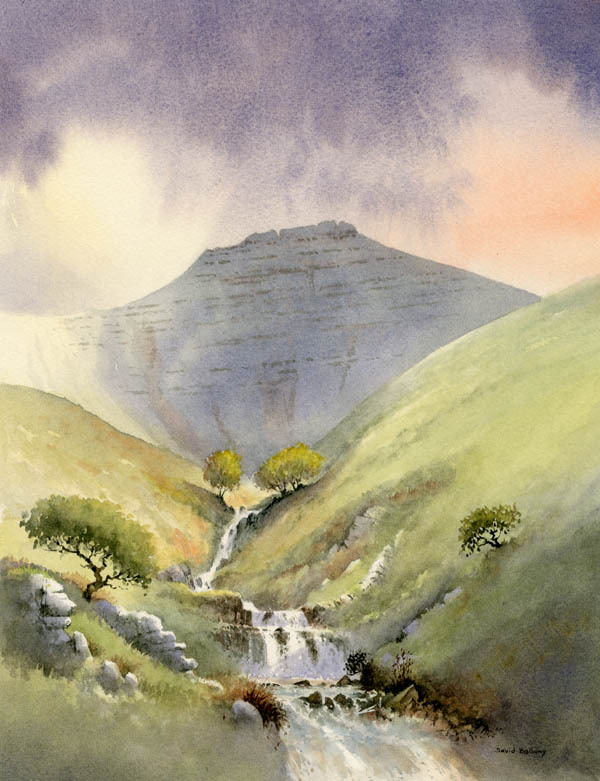 This entry was posted in David Bellamy, Painting in spring Ardent Gallery by David Bellamy. Bookmark the permalink.